Fariba Aghabaglou, doctoral student in biomedical engineering, won first place among graduate students and faculty with a pitch for SmartFlex, a smart bandage system. Dominic Nguyen, undergraduate student in chemical engineering, took first place in the undergraduate category for Yumaroo, a web-based platform that helps customers decide where to eat. 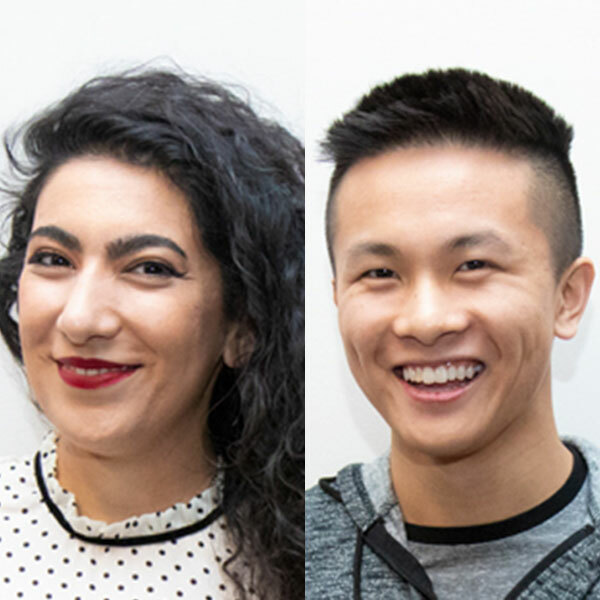 Fariba Aghabaglou (left) and Dominic Nguyen took first place Dec. 3 at the Engineering Pitch Challenge. 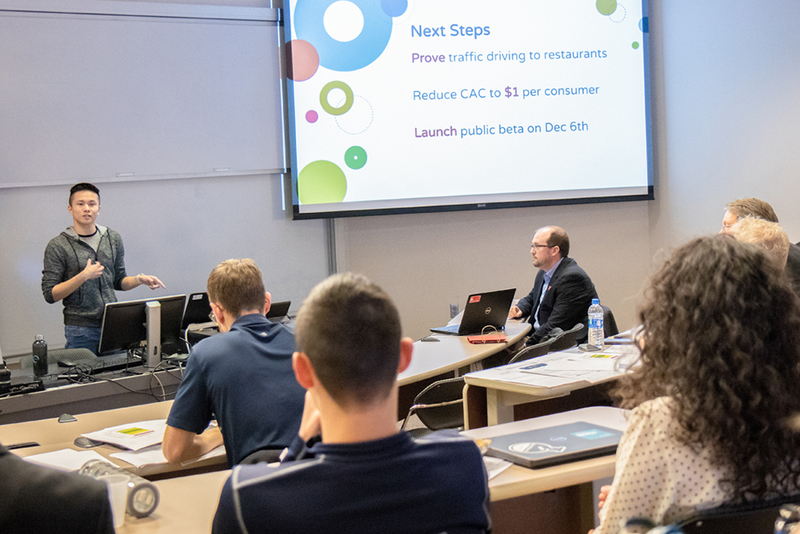 Eight teams competed in the inaugural Engineering Pitch Competition Dec. 3, sharing stories related to technical engineering problems and presenting market solutions. The competition, held in SEC 237, provided two business pitch categories: one for undergraduate students and another for graduate students, postdoctoral researchers and faculty. Hosted by Nebraska’s College of Engineering, NUtech Ventures and the Center for Entrepreneurship, it also featured teams with at least one engineering representative. 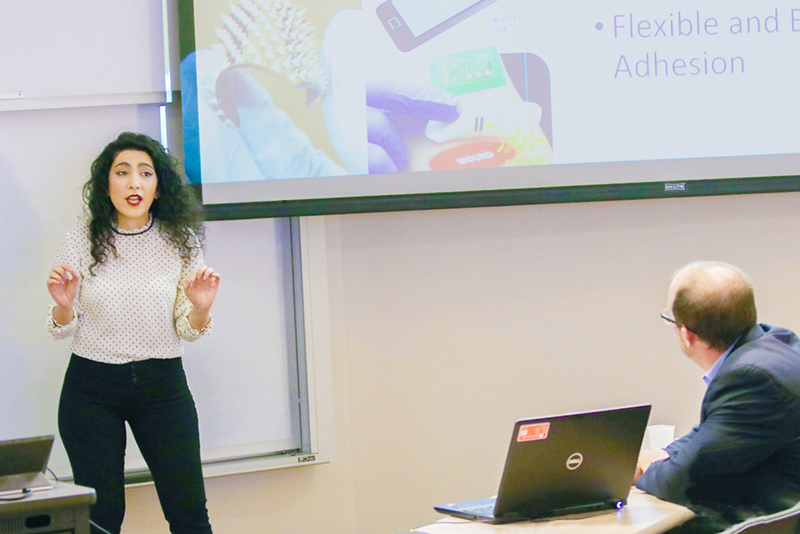 Fariba Aghabaglou, a doctoral student in biomedical engineering, won first place among graduate students and faculty with a pitch for SmartFlex: a smart bandage system with the potential for wireless remote drug delivery and monitoring. Dominic Nguyen, a senior in chemical and biomolecular engineering, took first place in the undergraduate category for Yumaroo. The web-based platform uses machine learning to provide restaurant meal recommendations, taking into account food restrictions and allergies. Among other pitches: a 3D pen to help fix bone defects, a pool alarm to prevent drowning and a device to help car owners easily check oil. Prior to the December competition, all participating teams had access to business mentors and practice pitch sessions. The competition was judged by Chuck Waterson, assistant professor of practice in business management; Vern Powers, Nebraska business owner and investor; and Ben Williamson, attorney and lead investor at Invest Nebraska. Awards included $1,000 and maker space memberships for Nebraska Innovation Studio.